By a strange coincidence we were being interviewed by Jim Gomez of the Associated Press around noon, Manila Time, about the famous "Thrilla in Manila since I was his government appointed Liaison Officer. Gomez informed me that Ali was in bad shape and he wanted my insights into Ali since I was close to him and developed a strong friendship with the man they called "The Greatest". It was a lengthy conversation and when it was over Gomez thanked me for the time and the thoughts. Hardly five minutes had gone by when my phone rang again and Jim informed me, "Ronnie when we were talking, Ali passed away." I was utterly distraught because only the previous night I was going through my stories on the "Thrilla" which would be included in a book I am writing titled "Reflections of 50 years in the Philippines" and was scanning through my library of photographs with Ali which brought back a flood of memories of an incredible human being in a cherished era. We were flooded by calls both from at home and abroad regarding our memories of the "Thrilla in Manila" and at times had to hold back the tears as we reflected on a good and decent man who touched the lives of millions in the Philippines and around the world. 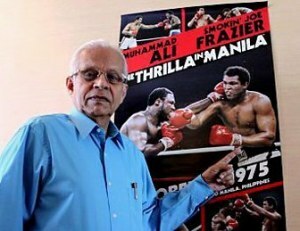 We remember having first called Ali while he was training at his camp in Deer Lake camp in Pennsylvania during the "Morning Show" hosted by Tina Monzon Palma on dzHP, "The Sound of the City" in Manila. To my utter surprise it was Ali who picked up the phone and after I introduced myself we had a long interview in which he said he would love to fight in the Philippines and that he wanted to take on Joe Frazier and George Foreman on the same night, one after another. He asked us to give his love to the Filipinos and his Muslim brothers and promised to visit the country. We were sent to Kuala Lumpur, Malaysia to meet with Ali and his trainer Angelo Dundee and spent some two weeks with him and covered his title defense against Britain's Joe Bugner before he returned to the US and I returned home. When Louie Tabuena and the First Lady Mrs. Imelda Marcos met with promoters Don King and Bob Arum and finalized the deal President Marcos asked Louie to report to him which he dutifully did and informed him that it would cost $10 million for the purses of the two fighters and that King would take care of everything else including air fares of the entourage of both boxers, hotel accommodation and everything else. Marcos said let's do it and clearly Mrs. Marcos had a major impact on the decision because she was aware how much the publicity would mean for the country in the midst of some rumblings in the western media about martial rule. When Ali and his girlfriend at that time, the statuesque Veronica Porsche paid a courtesy call on President Marcos and the First Lady, Marcos looked at Veronica and said "Your wife is beautiful." Ali immediately took one glance at Imelda Marcos and quipped, "Mr. President you haven't done too badly yourself" and everybody enjoyed a hearty laugh. President Marcos told the media moments later that he wanted the "Thrilla in Manila" so he could 'show the world that the country was peaceful, we have no peace and order problems,the economy is doing well and our people are content." Ali embraced the president and told me in his hotel suite that he respected President Marcos very much. Their bond was strengthened by the fact that Marcos himself was a boxer during his college days and was an ardent fan of the sport. While we were the manager of the government television network - Maharlika Broadcasting System- President Marcos asked us to make sure to get all the big fights and have them fed for his study by microwave so he could watch them "live." That included the "Rumble in the Jungle" against big George Foreman in Kinshasa, Zaire which impressed Marcos tremendously. Don King and Arum wanted to follow up on the success of the African adventure by traveling to the Philippines at what was to them a fascinating time in the life of the nation. Whenever we met Bob Arum in the US he always spoke about his wonderful memories of the Philippines and made special mention of Mrs. Marcos and how charming she was and often invited him to lunch or dinner with some of her friends which was "throughly enjoyable and a lot of fun." Ali who was hammered by Joe Frazier with thunderous body shots in the middle rounds wanted to quit and in fact asked Bundini Brown to untie the laces of his gloves which was I believe somewhere in-between the championship rounds of 10-14 as it turned out. But trainer Angelo Dundee pushed Ali back onto his stool and told him sit down you are going to finish this fight. He did and the rest is history. His rapier-like jabs almost totally shut the left eye of Frazier who couldn't see the right hand of Ali as he continued to pepper him with right straights which prompted Frazier's esteemed trainer Eddie Futch to tell referee Sonny Padilla to stop the fight because Joe "couldn't see Ali's right hand" and he didn't want to see him go blind and end his career. Ali said moments later "it was the closest thing to dying." But in the context of the times and what he had done for the Philippines, his memory as "The Greatest" would never die.